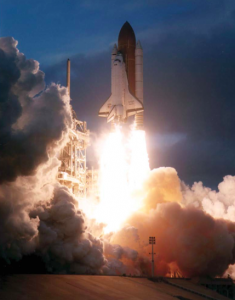 When Chris Hadfield boarded the space shuttle Endeavour for the STS-100 mission, he expected a smooth ride into space. The objective of the mission was to deliver and install the second generation of the Canadarm on the International Space Station (ISS). Two hundred fifty miles above the earth, the crew assembled the robotic arm, using it like a construction crane to successfully build and maintain the ISS. Once safely in orbit, Hadfield briefly abandoned his spaceship becoming the first Canadian to walk in space. He passed a portable foot restraint the size of a folded bicycle to his crew mate. Suddenly, the ninety pound piece of equipment drifted into space and he feared the worst. Floating objects can act as “hand grenades in space,” he says, referring to the inherent dangers loose equipment pose on spacecrafts. The incident served as an early lesson to approach procedures in greater methodological fashion, paying particular attention to the minutia of his movements, and double-checking every latching. Though Hadfield’s first mission, STS- 74—NASA’s second space shuttle mission to rendezvous and dock with the Russian Space Station Mir—was successful in that the crew aboard Space Shuttle Atlantis attached a five ton docking module to Mir, transferring food, water, and scientific supplies to American and Russian cosmonauts in eight days, other missions proved less successful, he highlights. During the Apollo 12 flight, the second manned mission to land on the Moon, astronauts displayed delayed reactions the Canadian calls “poor simulation in advance.” The crew members broke their lunar video camera, damaging the lens. Thankfully, a few images from their mission were saved. On another mission astronauts did a three-person spacewalk to capture a satellite that failed to separate from the rocket, due to a faulty wiring between them. 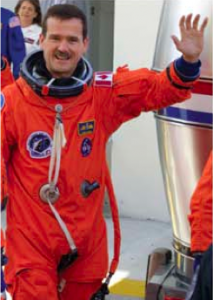 Hadfield understands that eminent achievements require years of robust training and acute memorization, since joining the Canadian Space Agency in 1992 as a test pilot, Hadfield trained several years to prepare for each mission. He has also trained in the Russian instruction. Considering thousands of failures and emergency procedures, he says that “astronauts have to understand and fix everything,”— from learning the shuttle’s intercom and mechanism systems to operating a robotic arm and walking in swimming pools with one-hundred-pound pressurized suits that heavily restrict body movement. The underwater training in neutral buoyancy labs engaged him in plenty of cardiovascular exercises. 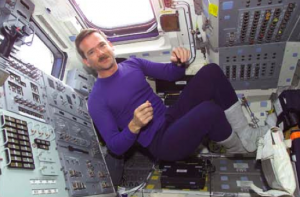 Territorial boundaries are irrelevant in space travel states Hadfield. Orbiting in space affirms that political barriers are broken down, eliminating any man-made boundaries. “There is a unifying emphasis on civilization,” he argues, sharing a unifying sentiment to protect humanity. He knows the challenges all too well, since he had intercepted Soviet jets while part of the Canadian Air Force in the 1980s. “I was flying fighter airplanes to intercept those Bears,” he says, referring to propeller-driven Bear Bombers, Tupolev Tu-95. With the end of the space shuttle missions, Hadfield expects several milestones in space travel under development since the space race. For the past sixty years private space companies competed in taking people into space at a relatively cheap cost, continuing an evolution of safe and affordable hardware. Already American launch vehicle and spacecraft developer, SpaceX is building cheaper launch pads to send cargo and crew into space. “We see a natural evolution of technology,” he says, quickly dismissing any revolutionary movements. Feeling optimistic about the Virgin Galactic that will potentially market missions for tourism, Hadfield hopes that private companies will find new ways to market space travel without the frenzy of the media interfering. The Canadian highlights NASA’s recent progress on the James Webb Space Telescope (JWST), a large, infrared- optimized space telescope developed by NASA. Due to launch in seven years, the telescope will search for the first galaxies that formed in the early Universe, hopefully connecting the Big Bang—the prevailing cosmological theory of the early development of the universe—to our own Milky Way galaxy. The Webb will have the capacity to see stars forming planets, connecting the galaxy to our own Solar System. In doing so, we will begin to understand stars in detail using powerful electromagnetic spectrum. Like all astronauts, Hadfield is curious about life on Mars. Historically Mars has had ice water, and recently running water, which would indicate that a living organism can survive on the planet. His enthusiasm about the prospects for a manned mission to Mars, leaves Hadfield dreaming of an opportunity that would honour him yet again as an over-achieving Canadian space man. After his long run of space missions, the Canadian would like to settle for a teaching post. The curriculum would include subjects such as space walking through design and atmospheric physics. In the future, he also hopes to engage in public speaking at conferences and universities to bring his rare human experience for the next line of eager young students of aeronautics and aspiring astronauts. He would like to publish a collection of notes he made during his missions, offering technical suggestions for the next astronaut struggling to manoeuvre a space ship’s hardware and software jumble. Hadfield often reminisces on his journeys outside our atmosphere, and among stories of space travel and beautiful views he returns to one particular lamentation: He misses playing guitar with crewmates.